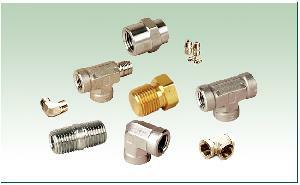 available for different pressure rating ranging from 270Bar to 760Bar. There are three types of tapered threads commonly use in Industrial application. All the three threads styles mentioned above use the same basic metal to metal sealing design for achieving a seal. Although very similar, there is difference in thread dimensions, pitch and flank angle that do not allow interchangeability. Because parallel threads only serve one function (i.e. holding the fitting in place), some other means of sealing is always present, such as elastomeric O ring or a metal seal. There are many variations of sealing methods, and in some cases, they are interchangeable among the different thread forms and may appear similar.